Ian has been involved in sport in the city since 1997. A spell on the committee of Derby Phoenix Swimming Club, including a campaign to keep the University swimming pool (now Lonsdale) at Mickleover as a public facility from 2000 was followed by honorary chair and managing director of the trust set up in 2007 to run the pool for the benefit of the community. Ian says: “The forum gives a collective voice to clubs and is a great way of getting an effect that is greater than the individual parts. A keen badminton player, Kevin set up Woodspring Badminton group with a colleague and in 2018 it is in its 10th year. It is a social badmint9on group, as opposed to competitive league matches, and caters for keen players from 15 to over 60 from the city and beyond. Like Ian, Kevin has been a member of the forum since it started. Bob was involved in the management of Spondon Cricket Club for more than 30 years before handing over his responsibilities in 2014 Now he is a player and exponent of walking football. Elected as treasurer in 2013 Bob is keen to grow the forum membership and see member clubs prosper. The forum is honoured to have swimming champion Ross Davenport as an ambassador to represent the club. 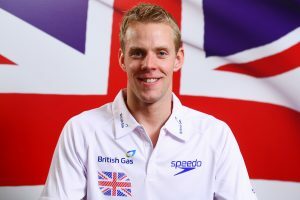 Ross made his Olympic debut for Team GB in 2004, finishing fourth in the 4x200m freestyle relay. He won double gold for England at the 2006 Commonwealth Games in the 200m freestyle and 4x200m freestyle races. He also represented Britain in the 2008 and 2012 Olympics and the world and European championships. Ross, who started with City of Derby Swimming Club, retired from competition in 2012. In 2017 Ross presented prizes at the Derby City Sports Awards, organised and hosted by the forum.